Over 70 delegates and speakers attended this one-day meeting on 3rd March 2017 at the Royal Society of Chemistry, Burlington House, London. The meeting was organised by the RSC’s Environmental Chemistry Group (Dr Roger Reeve), Separation Science Group (Professor Graham Mills) and Water Science Forum. Speakers discussed the monitoring and screening of a wide range of regulatory and emerging pollutants (such as pharmaceuticals and personal care products) and the detection of potentially hazardous compounds in dusts and consumer products. There were also exhibitions by instrument manufacturers and suppliers of laboratory consumables. Seven presentations were given by UK academic institutions, government agencies, and industry, with keynote lectures by Dr Jaroslav Slobodnik (Environmental Institute, Slovak Republic) on the harmonisation of techniques used to analyse emerging environmental pollutants in European river basins and Professor Jacob de Boer (Vrije Universiteit, Amsterdam, Netherlands) on the use of direct probe mass spectroscopy to analyse exposure of humans to brominated and non-brominated flame retardants from household dust. Professor Graham Mills (University of Portsmouth, UK) opened the meeting, welcomed the delegates and chaired the morning session. The first presentation, ‘Screening of complex forensic and environmental samples using high resolution analysis and in silico data mining tools’, was given by Dr Leon Barron (King’s College London, UK). Analysis of contaminants in river water and wastewater can be divided into targeted analysis of known compounds and untargeted analysis. Untargeted analysis indicates, in the first instance, all resolvable components. Between these approaches, suspect screening is employed. In silico methods can help identify chemicals during suspect screening. Application of this technique identified pharmaceuticals, personal care products, illicit drugs, and explosives. 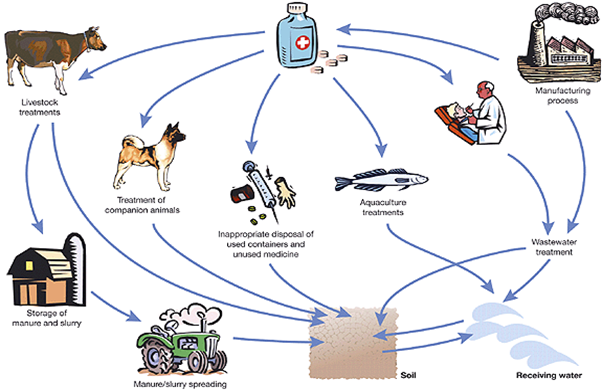 Possible inputs of pharmaceuticals into the environment are shown in Figure 1. The methodology for analysing the medical drugs (100 mL water sample, solid-phase extraction, with liquid chromatography-high resolution mass spectrometry) produced 166 components for screening, of which 40 were selected for quantitative analysis. Artificial neural network analysis of the components can predict chromatographic retention times and was used for the preliminary identification of new compounds in the samples. LogD (the logarithm of the distribution coefficient D), logP (the logarithm of the partition coefficient P), number of C/O groups and benzene rings contributed most to the fitting. This analysis complemented identification by data mining of the high resolution mass spectroscopy data. Although these methods are an aid to identification, they are not intended to replace the traditional use of standards, but instead intended to be used to optimise the analytical effort needed to quantify a large number of components. Dr Andrew Sweetman (Lancaster University, UK) discussed ‘Use of passive samplers as a potential compliance tool within the EU Water Framework Directive’. Passive samplers can be used over many days, giving time weighted average results as an alternative to averaging several sequential grab water samples. The specific type of sampler investigated was DGT (diffusive gradients in thin films), originally developed to determine metal lability, but now being developed for antibiotics, personal care products, pharmaceuticals, pesticides and flame retardants. A diffusion layer is sandwiched between two resin gels (HLB resin is used most commonly), as shown in Figure 2. The sampler is deployed in the environment and left to sequester pollutants over 1-2 weeks, after which time the accumulated components are extracted from the resin and the masses determined. Using knowledge of the diffusion rates masses can be related back to the dissolved concentration in the environment. The dissolved concentration reflects the biologically available fraction, but does not directly provide ‘total concentrations’ required by the EU Water Framework Directive. An estimate of this value can be made using partition theory. In field tests, the method has been compared with auto-sampling and grab water sampling. Successful field trials of this technique have been conducted in the Liuxi river, China (Figure 3) and at a wastewater treatment plant. Further work is needed to define sampling rates and operating range and to assess the potential of DGT samplers for predicting ‘total concentrations’ for a wide range of chemicals. Professor Colin Creaser (Loughborough University, UK), in his presentation ‘Combining ion mobility spectroscopy with mass spectroscopy for the analysis of complex samples: the potential for environmental analysis’, introduced this technique, which at present has relatively few applications, but shows great promise for environmental analysis. Two formats were discussed. In drift-tube ion-mobility spectroscopy (DTIMS) separation is achieved by the differential mobilities of ions in the presence of an electric gradient and a buffer gas. Field asymmetric ion mobility spectroscopy (FAIMES) has an oscillating field which selects individual ions, similar to quadrupole mass filters in conventional mass spectrometers, but it is able to be used at atmospheric pressure. As a stand alone instrument, the technique is transportable and has field based applications. It is easy to use, has rapid response and high sensitivity, but a narrow dynamic range (1-2 orders of magnitude) and low resolution, limiting applications to simple mixtures such as BTEX (benzene, toluene and xylenes). To overcome the limited resolution within the laboratory, the technique can be coupled to conventional quadrupole or time of flight mass spectrometers. Applications included electrospray ionisation-DTIMS-quadrupole mass spectrometry for the targeted analysis of sulfonylurea herbicides in river water and haloacetic acids in water. For non-targeted analysis, collisional cross-sections, which are derived from the drift time, can be correlated with library or other standards for identification of analytes. This aspect was illustrated by identification of cyclophosphamides in wastewater. Use of the techniques gives improved performance over standard methods for targeted high throughput quantitative analysis and increased peak capacity for non-targeted applications. Professor Stuart Harrad (University of Birmingham, UK) discussed the problem of ‘Brominated flame retardants in waste consumer articles’. There is widespread use of these compounds in consumer products such as carpet underlays and furniture, in building insulation foam and also in electronic waste. Their concentrations in human milk appear to be increasing over time whilst other high molecular mass neutral pollutants such as polychlorinated biphenyls (PCBs) are decreasing. New legislation now requires electronic waste to be separated from other waste streams and the material recovery is tightly controlled. In less developed countries, electronic waste disposal may be more rudimentary and the compounds may enter the wider environment and hence the food chain. Exposure to brominated flame retardants via eating food produced around the rudimentary recycling plants in Taizhou City, Eastern China has been shown to be significantly higher than in remote locations. Laboratory work investigated a change in leaching rates with variation of disposal conditions such as contact time, temperature and the waste matrix. Leaching from furniture and waste fabrics appeared facile, leading to the conclusion that more sustainable waste management for these products as well as for electronic waste is needed. The immensity of the problem was confirmed by a detailed analysis of brominated flame retardant concentrations in a wide range of consumer products. The use of hand held x-ray fluorescence (XRF) spectrometers was suggested for disposed product analysis (monitoring bromine) rather than conventional gas chromatography-mass spectroscopy or liquid chromatography-mass spectroscopy; preliminary testing suggested a low incidence of false-positive results. The morning finished with the first keynote lecture by Dr Jaroslav Slobodnik (Environmental Institute, Kos, Slovak Republic) on ‘Non-target screening of environmental pollutants in the context of risk assessment of European river basins: the NORMAN network perspective’. The NORMAN network within the EU (http://www.normandata.eu) has been set up to enhance the exchange of information on emerging environmental substances, their validation and harmonisation of analytical techniques. There is currently no satisfactory explanation of the ecological status of most European river basins; current priority substances do not explain all the effects. This lack of an explanation may be due to emerging pollutants (pharmaceuticals, personal care products, biocides, transformation products). Attention is usually focussed on well-known contaminants and less on metabolites and transformation products. Individual pollutants are also assessed assuming they occur in isolation and not in mixtures. Of the many compounds present, only a few determine the risk, hence the need for prioritisation. The NORMAN network and ECOTOX database provides a methodology and resources for prioritisation. Suspect and non-target screening approaches should be integrated into the screening process. Prioritisation should be determined on a broader basis than in current schemes and may be achievable by establishing open-access databases and multivariate analysis of environmentally detected chemical patterns and toxicity profiles. Lunchtime provided an opportunity for delegates to network and inspect the sponsors’ exhibitions. After lunch, Professor Mills introduced the second keynote speaker, Professor de Boer, after which the afternoon was chaired by Dr Roger Reeve (University of Sunderland, UK). Professor de Boer (Vrije Universiteit, Amsterdam, Netherlands) discussed ‘Human exposure to environmental contaminants: direct probe time-of flight mass spectroscopy reveals a multitude of chemicals indoors ’. The talk centred around flame retardants starting with brominated compounds and then non-brominated alternatives, including chloroparaffins and phosphorus-based compounds. There are neurotoxicity concerns for the latter group. Samples of indoor dust contain complex mixtures of flame retardants as well as other chemicals. Direct probe mass spectroscopy, which introduces the solid sample directly into the ionisation chamber of the mass spectrometer, has been used as a fast screening technique (typically 5 min per sample) for compliance with legislation. As many retardants are highly non-polar, atmospheric pressure chemical ionisation APCI and APPI (atmospheric pressure chemical ionisation and photoionisation) are suitable ionisation techniques. The method avoids losses found in techniques using extraction/separation. Monitoring taste and odour substances in drinking water is a regulatory requirement linked to acceptable ‘wholesomeness’ of potable water. Mr Gavin Mills (Severn Trent Water PLC, UK) described ‘Advances in the identification of tastes and odours in drinking water’ including the current state of the art methodology. Sample preparation for injection into the gas chromatograph is automated using Instrument Top Sample Preparation (ITSP) cartridges. These provide solid phase extraction clean up of the sample as part of the automation system. Gas chromatography triple quadrupole mass spectrometry is useful for routine work whereas gas chromatography quadrupole time of flight, with greater sensitivity and selectivity, allows simultaneous determination of targeted and non-targeted compounds. A supplementary ‘detector’, an odour port allows individually eluting compounds to be matched to the odours. Examples were given of identification and determination of low-level ‘tasty’ compounds found in water samples, one of which was not even present on international databases. Ms Erika Castringanò and Mr Luigi Lopardo from Professor Barabara Kasprzyk-Hordern’s group at the University of Bath, UK gave a presentation that asked the question ‘Can urban water profiling inform our understanding of the state of environmental and public health?’ The main example, provided for context, concerned the misuse of pharmaceutical drugs, which appear in wastewater. The drugs (as with most pharmaceuticals) are chiral and single enantiomers are used for legitimate medicinal application. Drugs bought on the street are less pure and can contain a mixture of the enantiomers. Analysis of the water samples by extraction-LC-MS using chiral LC columns allows the concentrations of the enantiomers to be determined leading to an estimation of the relative proportions of the legal and illicit use of the drugs. Investigations of water profiling have been extended to endocrine disruptors and determination of metabolic biomarkers. In vitro studies combined with urban water analysis can be used to determine public exposure. Dr Mark Perkins (Anatune Ltd., UK) in his presentation ‘VOC measurements in ambient air using Selected Ion Flow Tube Mass Spectrometry – automation and calibration considerations’ described developments in the technique to produce an autonomous air monitoring system. The work was in collaboration with Dr Marvin Shaw at the University of York, UK. The selected-ion flow-tube mass spectrometer (SIFT-MS) technique (Figure 4) involves the chemical ionisation of the analyte by selected positive precursor ions. These ions are produced from humidified air by a microwave plasma which means no external gas supplies are needed allowing autonomous field use. Although the technique allows concentrations to be determined directly without standards using library reaction rate data, high accuracy calibration uses traceable gas standards. Prior to deployment, optimisation included sensitivity and limit of detection. Current field trials in Beijing, China are evaluating the robustness and reproducibility of the SIFT-MS in routine field deployment, and determining the accuracy and precision of the SIFT-MS for measuring real time trace level VOC mixing ratios. The above synopses were prepared by Roger Reeve and Graham Mills based on the presentations and slides supplied by the speakers. The industry meeting sponsors were Agilent Technologies, Anatune Ltd., Hichrom Ltd., Imspex Diagnostics Ltd., Kinesis, Markes International and Thames Restek Ltd. Financial support is also acknowledged from the Environment Sustainability and Energy Division of the RSC, which facilitated the attendance of the two international speakers.